In the game, players draw star cards, which represent the seven types of stars in the universe. Each constellation requires a unique combination of stars to play on the board. 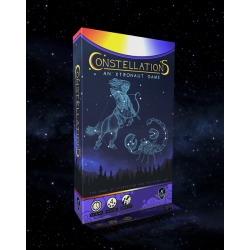 As the game progresses and the night sky fills up, players must use their puzzle skills to fit the last few constellations on the board. The player with the most constellation points at the end of the game wins!